If you’re looking to remodel your home, you might want to consider an energy-efficient design. 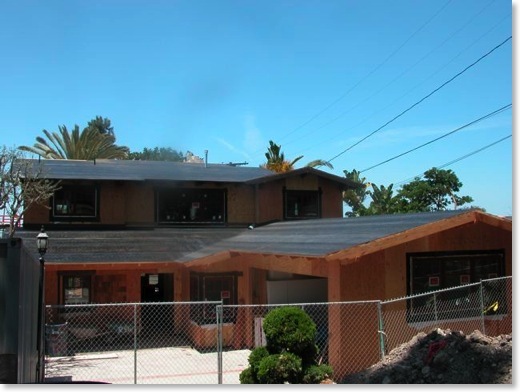 A green remodel can make your home more efficient and save you a considerable amount of money in energy costs. Aside from the money-saving benefit, green designs minimize your impact on the environment by creating fewer emissions and using renewable resources. Before you get started, you may want to consider scheduling an energy audit. 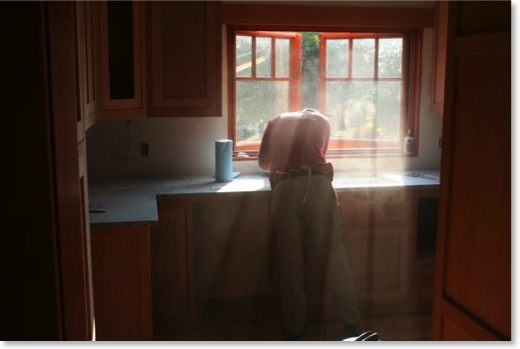 It is a great way to see where your home needs energy-efficient improvements. Once you know where you need to make improvements, there are a variety of eco-friendly options to make your home run more efficiently and have a smaller impact on the environment. If your renovations include upgrading your appliances, consider purchasing ENERGY STAR appliances, which meet strict efficiency guidelines set by the U.S. Department of Energy and the Environmental Protection Agency. They will significantly reduce your energy use and could save you up to a third on your energy bill. 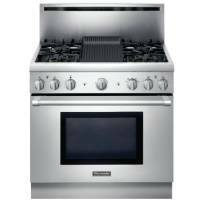 Finding these efficient appliances is easy since many appliances now come backed by ENERGY STAR. 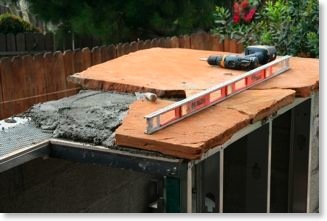 A renovation is a great time to beef up the insulation in your home. Keeping a well-insulated home slows the rate that heat and air conditioning escape, reducing the energy required to keep the house at a comfortable temperature. Many older homes typically have less insulation than newly built homes, however, adding insulation to any home could significantly reduce your energy costs. As you are renovating your home, think of areas where you can use solar energy. Why not buy a hot water heater with a solar panel? It could reduce your energy usage and ultimately reduce your energy bill. Installing solar panels on your roof is another energy-efficient option. By using this alternative energy source you could eliminate or significantly reduce your energy bill. If installing solar panels is not in the budget, consider switching to a green energy supplier. Green energy is generated from renewable resources, such as solar energy. Some suppliers allow you to purchase up to 100% renewable energy. While it may not save you money, it's certainly good for the environment. For example, if you live in Texas you can visit Energy Providers Texas to see if there is a green energy provider in your area. A typical home can lose up to 25 percent of its heating or cooling through windows. A great way to increase your home's efficiency is to replace your old windows with double-pane, energy-efficient models. ENERGY STAR windows are said to be twice as efficient as older windows. As an added bonus, some energy-efficient windows are eligible for a federal tax credit. Whether you are doing a big remodel or some simple fixes, be sure to save room in the budget for a programmable thermostat. Your air conditioner or heater has to work hard to keep your home at a constant temperature. This causes the unit to use more energy and cost you more money. Fortunately there are many types of programmable thermostats that can help you take control of your energy use. A basic model allows you to program your thermostat to turn on or off at certain times, and it is relatively inexpensive. Some more advanced models allow you to control the temperature in your home through a computer or smartphone. So if you are at work and need to stay later than you anticipated, you could reduce the temperature with the click of a few buttons. If you want to go really high-tech, there are even models that can learn your heating and cooling habits. For example, if you go to work every day from 8 to 5, the system would learn this pattern and cool your home accordingly. When you leave for the day, the thermostat will turn itself off and before you return home, it will return the house to your usual, comfortable temperature. 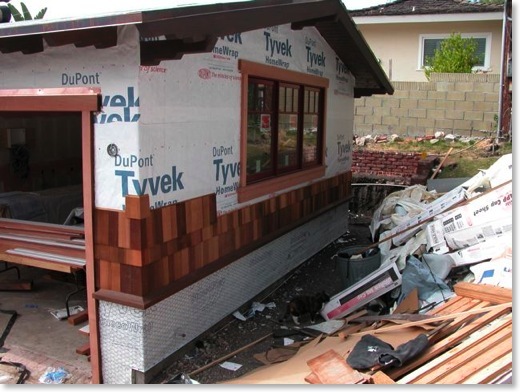 Craftsman Home Remodeling Blog WINS!!!! 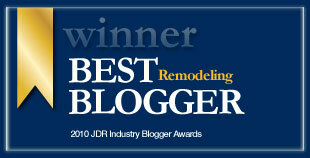 Thanks to all of you, the Craftsman Home Remodeling Blog has won the 2010 JDR Industry Blogger Award in the Remodeling category. Due to excessive abuse of the Craftsman Home Remodeling Forum by spammers, I have had to shut it down. Not only was the forum being blasted with inappropriate messages but somehow the spammers were using it send out SPAM emails. I do plan on resurrecting the forum at a later date with much more stringent controls. 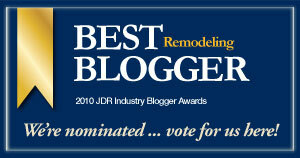 The Craftsman Home Remodeling blog has been nominated as Best Remodeling Blogger in the 2010 JDR Industry Blogger Awards! Voting is now open. Please vote for us here today! 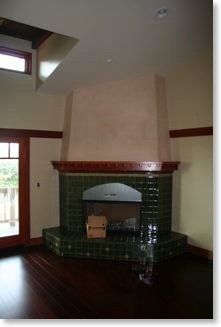 Welcome ForteFaucets.com and ForteLight.com to the Craftsman Home Remodeling Network. A recurring theme in emails I receive from the Craftsman Home Remodeling readers has to do with where is the best place to get a sink, faucet, chandelier, toilet, etc., etc. I decided that I should create these two web sites as part of the Craftsman Home Remodeling Network to give our readers a place to shop for these items. Now you can finally have the Kitchen or Bathroom you've always dreamed of - without the frustration of going from one store to another searching for that perfect faucet or fixture. All this without weeks of searching for an accessory to match. That's because we've designed an online store with over 272,000 items where you can find all the best names in kitchen and bathroom plumbing including Delta Faucets, Delta Select, Moen, Grohe, Price Pfister, Insinkerator and more at guaranteed low prices! As your premier home lighting dealer, we are proud to offer a full range of products for the do-it yourselfer or contractor. We have an extensive online catalog of over 42,000 products offering a wide variety of home lighting products from Kichler, Minka, Murray Feiss, Quoizel, Maxim, Sea Gull, Progress, Monte Carlo, and more. Our fully trained Customer Service Representatives care for you and will help you with your product selection and any questions you might have. You can always count on ForteLight.com to have the right light at the best price. Make sure to sign up for our newsletter. Not only will you receive home remodeling tips but I will also include coupons for the stores. 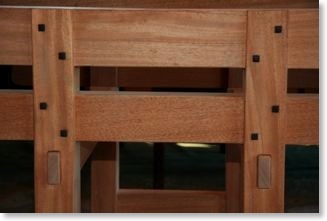 Of course, I also provide these on the Craftsman Home Remodeling site, but signing up will make sure you don't miss out! 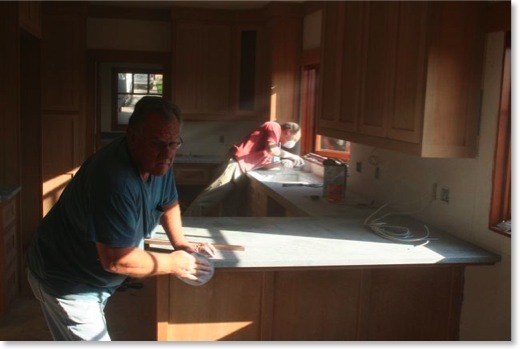 There are many things to consider when remodeling or purchasing an older home. Homes built before 1980 have the strong likelihood of containing asbestos. Due to a steady progression of technology and green sustainable methods, there are many ways to ensure your home or property is asbestos free. If you are interested in saving money, remodeling and improving your carbon footprint, here is some information to get you on the right track. Used in millions of homes throughout the last quarter of the 20th century, asbestos insulation can become a real dilemma for homeowners due to causing a variety of health problems, including Peritoneal Mesothelioma and Malignant Mesothelioma. These types of cancer take the lives of thousands each year. Non-regulated asbestos material can be legally performed by homeowners, regular contractors, or licensed asbestos abatement contractors as long as the National Emissions Standards for Hazardous Air Pollutants (NESHAP) are not violated. Asbestos removal in public facilities, homes and workplaces must be undertaken by a licensed asbestos abatement contractor. Once the removal is complete, green insulation options should be given serious consideration, such as: Cellulose, Cotton Fiber and Lcynene. The United States Green Building Council (USGBC), in a study conducted in 2003, estimated a savings of $50-$65 per square foot for well-constructed green buildings in the U.S. (see table below) during that year. The numbers continue to improve as more eco-friendly options become available, and those kinds of figures have finally begun to attract those who thought eco-friendly construction was just a bunch of hogwash. The magazine that had contacted me several months ago was This Old House. I had submitted a few before and after pictures and they really liked it. Unfortunately, I didn't have enough before pictures for them to run a story. If you remember, when this project started the plan was to add a room and try to save everything so there wasn't supposed to be any drastic changes. Also, the demolition guys worked so fast that I couldn't get any pictures after the first day. I worked with one of the This Old House writers for about a month to get her all of the information she needed. After pitching it to the editor, it was decided they would not do anything with it due to the lack of before pictures. If any other magazine people are reading this (American Bungalow, Sunset, etc. ), you can feature this house if you like as it has not been in any magazine....yet. I can't believe it but another magazine called asking for pictures and saying that they may want to possibly use the house in a future issue. This is quite exciting for us. I don't want to mention the name unless something is official but it is a major magazine. Keep your fingers crossed! 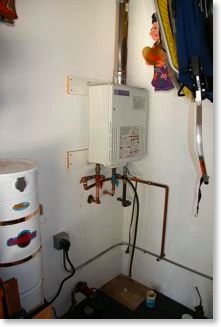 I want to streamline my hot water system setup to hopefully save electricity and money. Let me first explain my hot water setup. 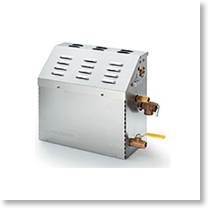 I have a Takagi Mobius TM-1 tankless water heater that receives cold water and outputs hot water on demand. The initial problem I had with water being on demand was I would have to let the shower run for 3 minutes just to get hot water. To remedy this, I had a 10 gallon electric heater hooked up to the hot outlet of the tankless water heater to maintain a reservoir of hot water that I would recirculate through the house every 30 minutes through the use of a recirculating pump. The problem I have with this setup is my electrical bills have been really high and I'm sure the electric heater is not helping matters so I'm trying to find ways to lower that expense. I'm not sure how much I'll save but I think it may be as high as $50 per month. 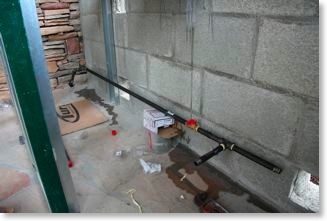 The following pictures show the tankless heater and recirculating pump right after the electric heater was removed. The plan is to bypass the electric heater and go straight from the tankless water heater to the recirculating pump. Since the system is open, I decided to flush the tankless water heater. You are supposed to do this every year but it has been two years since I installed it and haven't done it yet. 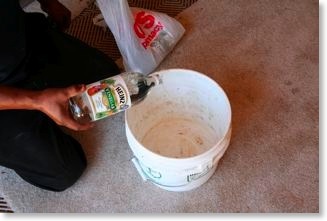 We are using two bottles of white vinegar. 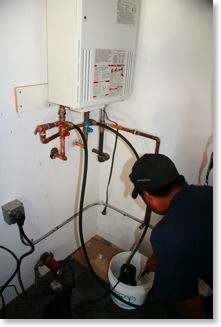 A small pump is connected to the cold water line entering the tankless water heater and a return line from the hot side is fed back into the bucket. Here you can see the whole setup in action. I still don't have any way to get into my garage and have been wondering about a fingerprint scanner mechanism so the kids won't have to remember a code. 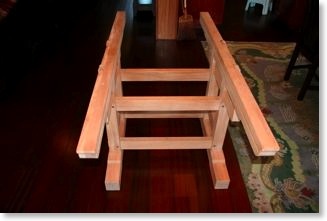 Well, I just found one that's made by Craftsman. 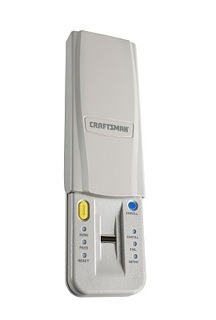 According to info I have read, it can store up to four unique fingerprints and takes about a minute to program it. You can read more about it here. What I like about it is that you can program a contractor's fingerprint into it for the one or two days he needs access without giving a numeric code. When he's done working, remove the fingerprint from the system and he's locked out! I have a problem sleeping when it's light out. Now that summer is coming the sun is rising earlier and as a result I'm waking up now at around 5:30AM. Some of you may have noticed in looking at the pictures that there are no shades, blinds, or shutters anywhere to be seen. It's not that we don't want any but we need to get a specialist in here that works with Arts & Crafts style shades and figure out how to incorporate them into the house without covering up all of the great woodwork. 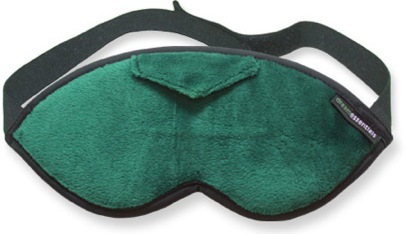 In the meantime, I wanted to share with all of you that I just purchased some eyeshades which are extremely comfortable, soft, and they block out 100% of light. Last week the central vacuum would not turn off. It is a Modern Day Silent Master S5. I couldn't figure out what was wrong so I unplugged the unit. I called the installer, All Makes Vacuum and Sewing Machine Co., who I also purchased it from, to see what they could do. The owner, Carl Tice, came out yesterday and in two minutes he removed the vacuum and put it in his truck. He thinks something went wrong with the circuit board. Today he returned with a new circuit board already installed in the vacuum and put it up in 30 seconds. No questions asked, it works great, and I got great service!!! 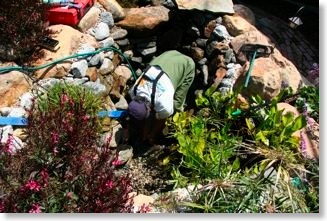 The koi pond has been entered into a pond landscaping contest for the LA area during June 6th to June 8th. 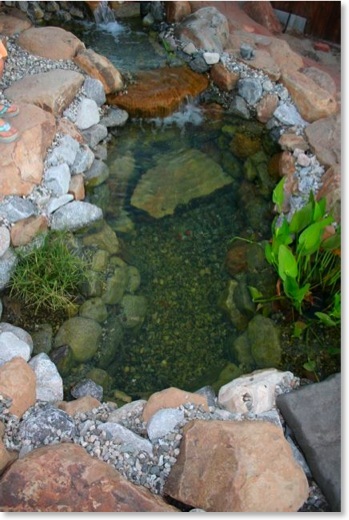 Due to its size, the pond was entered in the small category of under $10,000. In preparation, Cor van Diepen of Paradise Landscaping, came over with his assistant Cesar (see April 16 blog post) for one last touch up before the judges come over this weekend. They spent time on details like making sure no rubber trim was showing and that every rock was in its place. There were a few bubbles showing at the waterfall that he called 'foam' and said we would lose some points if that was there when they came by. I'm going to see if I can find something to get rid of it tonight. Today I had the koi pond cleaned out. There was a bunch of muck on the rocks and it just seemed like the time since it has been 2 years since it was installed. They started draining the water before taking the fish out. 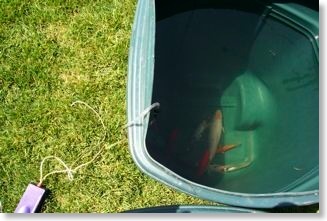 Once there was only a few inches of water left, they started to catch the fish and move them to their temporary house; a large trash can. After Cesar caught all fish he could, he drained the pond completely and even sopped up the remaining water with a sponge. 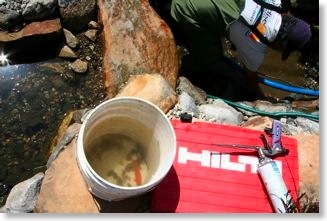 The troubling part to me was that 4 fish were in the rocks flopping around. I could here them but there was no way to get to them. I was told not to worry. While Cesar scrubbed the rocks, Cor cleaned out the biotic filters. The picture below shows the lava rocks that sit in a bag at the top of the waterfall. There is bacteria living in those rocks so they get a superficial cleaning. You are probably wondering what happened to the four fish. Well, after about 30 minutes of no water, the pond was refilled and the fish swam out of their holes. Amazing! The landscaping is filling out very nicely right now. 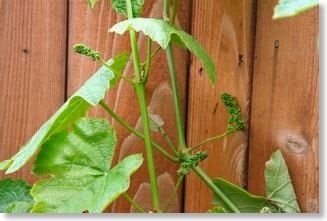 I planted a Concord grape last summer and there are at least 50 bunches of grapes starting to form on it. The Haas avocado, Babcock peach, and Santa Rosa plum trees are full of flowers and small fruit. And last but not least, my little artichoke plant that was cut to the ground about 4 months ago is growing with a vengeance and about 5 feet tall now. Concord grapes are starting to appear. 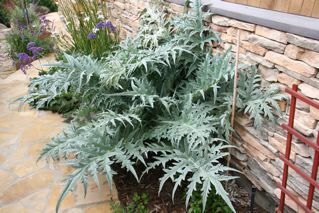 The artichoke plant is growing FAST! 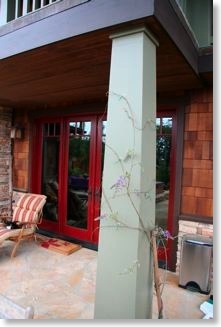 One of my plans was to have wisteria grow up the columns around the house and frame out the different entry ways. I may be a few years off from that but they are growing quite nicely and the purple flowers are strikingly beautiful. 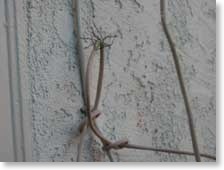 I'm going to have to get a small trellis built between the columns as the wisteria will be tall enough to grab on soon. Today is the first of two days for the Yule Parlor Parade. 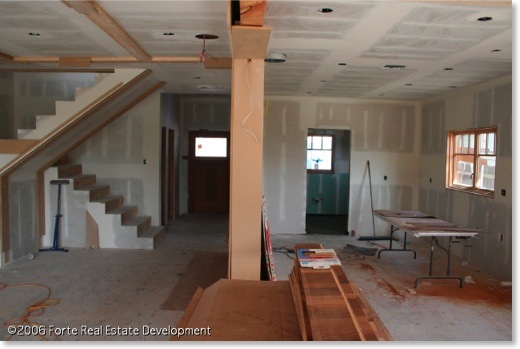 Several months ago we were asked if we would consider our house for the homes tour. We agreed and now we have 1200+ people coming through with little blue booties. It's a lot of fun! You can see the pictures of the decked out house just before the people came in listed in the Photo Gallery under Finish Pictures. 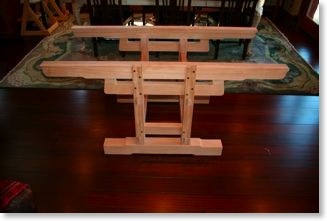 A month before Dave Barlow was finished with the interior woodwork, I asked him if he thought he could build a dining room table out of mahogany and ebony from plans that I saw in a woodworking magazine. After a few weeks of studying the drawings, Dave said " Do you want it exactly like the plans show?" I asked him why and he told me that he could make it better. So we started. 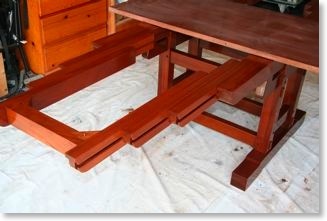 Below are a few pictures of this table being built. It took 5 months to complete. 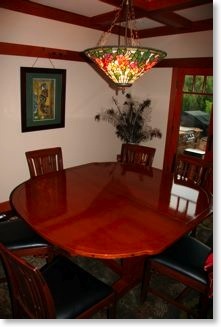 The table is modeled after a table in the Robinson House, another Greene and Greene design. With both leaves in, it can comfortably seat 14, without the leaves it can easily seat 8. 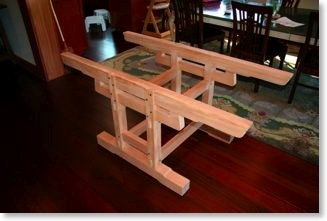 It weighs in at about 150 lbs for the base and 150 lbs for the top. 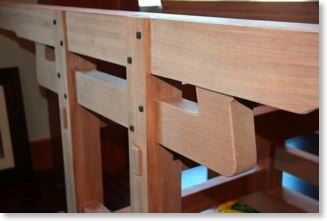 The extensions are wood sliding on wood, there are no metal sliders. Also notice that your knees won't hit anywhere around the table. 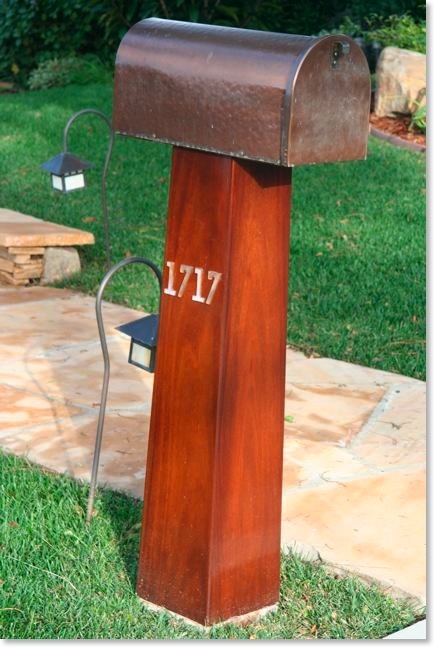 Dave Barlow made me a custom, mahogany mailbox post to hold the copper mailbox I bought. It is a furniture grade box and slides right over the installed 4x4. I made the numbers out of glass because I couldn't find any I liked that would contrast the dark background. With the sun beating down on the garage door, the mahogany was getting bleached. I decided to have the garage door and front door sanded and stained. 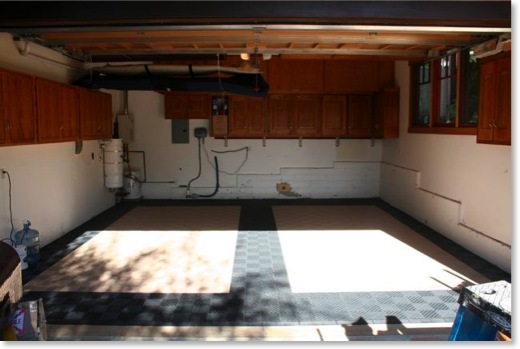 The garage door took three weeks to do. What a job! After living in the house a few months, we decided that our portable barbecue wasn't going to hack it. 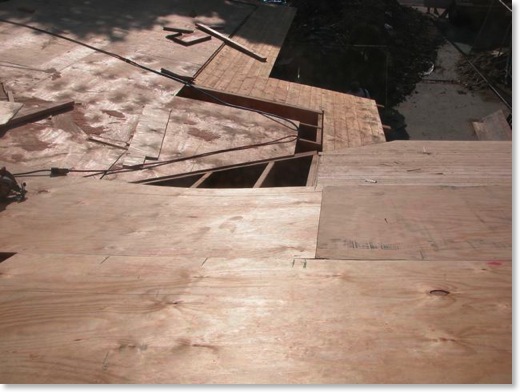 We also had a concern that the side of our deck dropped off and wasn't safe for people. 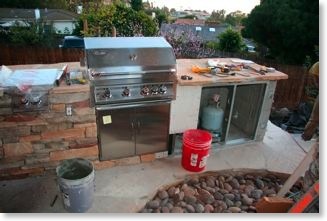 The result is we built in an extension off the house at the edge of the patio to house a barbecue, ice chest, double burner, three drawers, power, and trash can. The block was built just off the house. 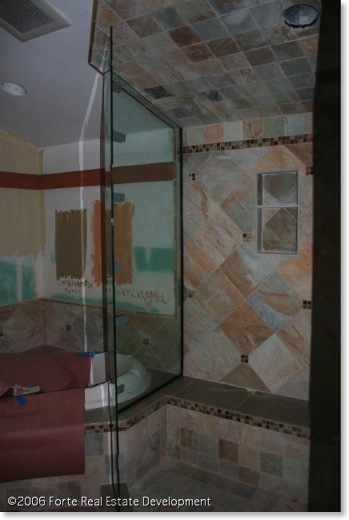 We tied it in using the stone veneer to make it look like one wall. 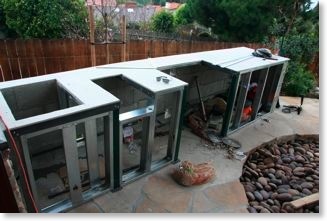 The structure was framed out with aluminum studs. The dark green posts are steel. The gas line was run in from under the house. 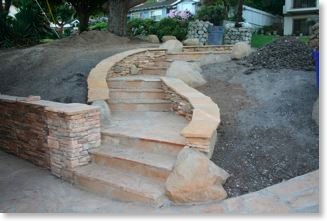 Golden Buckskin flagstone was used on the top to match the patio and the face is stone. It looks like the barbecue island was here all along. Now that I am moved in, it's time to take care of some details. I want to be able to keep the the garage floor clean and dry but I wasn't crazy about the idea of putting epoxy paint on the floor. After a bit of research, I came across RaceDeck. This floor is used in showrooms and looks perfect for what I want it to do. 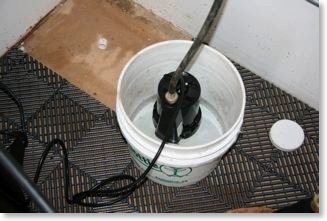 I bought the Freeflow type as it allows water and dirt to fall through to the floor underneath. When I rarely need to clean it, I just vacuum the floor and everything below comes up. 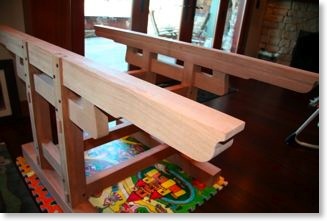 The pieces snap together like a puzzle making it real fast and easy to complete. The hardest part was emptying and refilling my garage. The installation below took all of 2 hours. Construction is Complete But Who Is The City Forester? September 24th was the 2 year anniversary of when we broke ground!!! • Most everything is done now and we are in the process of moving in. In this city, to get signed off, the City Forester must sign off the inspection report. He came over, pulled out his spray paint and put this circle 7 feet off the street in the middle of my front yard and said you will plant a 24" box, Japanese Cherry Tree a.k.a. Pink Cloud. Since this is in the City right of way, I am basically giving the city a gift per their direction. In my opinion, there are now too many trees in the front yard as it was perfectly balanced. Time will tell how it all fills out. 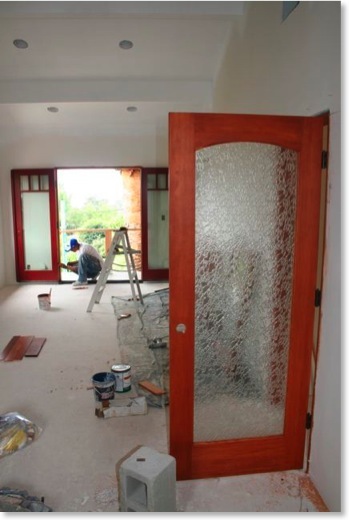 • Code states that glass doors must be put in all interior fireplaces. There is a fireplace store in town that rents doors for 30 days to get through inspection for just over $200. It's one of their standard services!!! • All that is left to do is minor stuff; low voltage lighting, seal the fence and new gates, make the stained glass for the front door, kitchen, and entertainment center doors, etc. • There is one more thing I forgot. 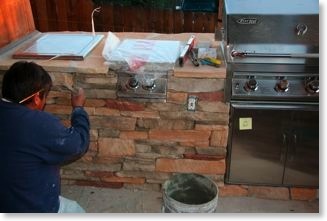 We had the rear patio fireplace stone redone to get rid of the seam at the 45 degree bend in the wall. While that was accomplished, the rest of the stone was redone but not to my satisfaction. I'm going to redo the opening and face of the fireplace again. • I am hoping to have the final pictures online by Thanksgiving. There are a lot and I still need to categorize and annotate them all. And last but not least, there is a third child on the way that is due at the end of November. There is a struggle with my gym being turned into a baby's room. For now, we are going to share it as I will not give it up that easily and the baby will mostly be in our room for the next couple of years. Maybe by then I will have to remodel to add another room! Just kidding....you can put a fork in it because this house is done!!! • Skim-coated all walls in house in preparation for paint. Individual patching of blemishes was not working and we needed to overhaul all walls. LESSON LEARNED: An eggshell finish is great for a house with kids but it's also great at pointing out every imperfection in the wall. If you don't have kids then definitely use a flat paint. We are using a flat paint for the ceilings. • Painting is all that is left with the walls. Stefan is continuing and 3 more painters come in next week to finish the place out. 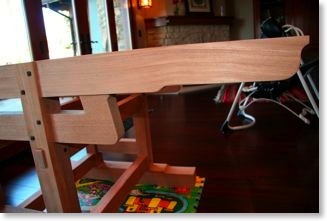 • The stair railing has been fit and will be sent out for refinishing. • All data, phone, and cable has been hooked up and patch panels installed in garage. • All exterior wall sconces installed. • Office is 100% complete. 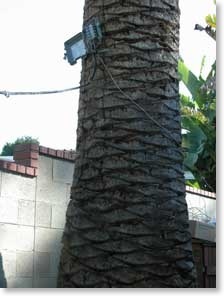 • Backyard is fully powered. 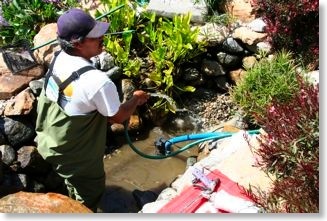 • Pond is fully operational with fish, snails, and tadpoles. • Spa is being filled. • Trees have been ordered. • Front pathway is complete. No....not yet! I hate saying this as I haven't been right yet but I expect us to start moving in by mid-July. • We are still painting rooms. Probably for another 3 weeks. 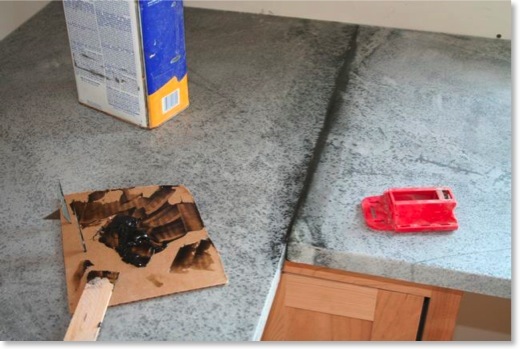 The problem is that all wall and ceiling surfaces need to be skim-coated. My GC was trying to keep the costs down by spot patching the walls and in hindsight it looks like it ended up costing me quite a bit more because it takes forever to spot fix these walls with all of the wood trim everywhere. A MAJOR Lesson Learned here is plaster the whole house or go in with the plan to skim coat over ALL drywall surfaces. 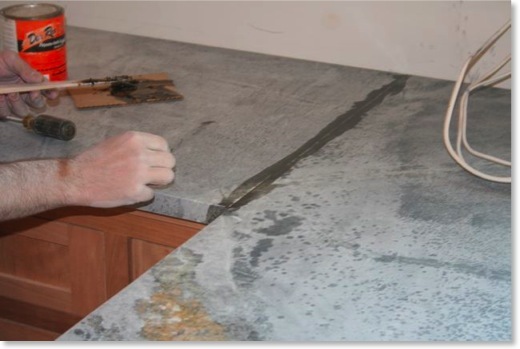 The bottom line is drywall may be faster and cheaper if your building a bunch of condos but it ends up costing a lot more if you are trying to do a good quality job. About half of the screws popped out with all of the hammering due to woodwork finishing. 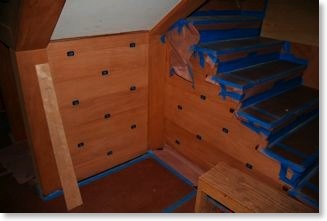 • Dave Barlow has finished the stairs and wainscoting and is now working on the staircase railing. After that, he should be done. He's been with us 1 year now, did all of the interior woodwork, and was only hired to do the stairs. Unbelievable! • Landscaping is going pretty well. The front driveway is complete, the front pathway is just about done, sprinkler valves are in, final grading and irrigation starts next week, and the waterfall/pond will finally start next week. Well it's mid May and I'm not moving in yet. It's quite frustrating and basically comes down to manpower. My new projection is the third week of June. I'm still taking pictures and will eventually get them loaded but I just can't seem to get in the mood to do it. Maybe I'm just lazy. Trust me though....the house is coming out so much better than I had hoped for and I will eventually get the pictures loaded. Once complete I will look into creating a searchable photo database to make it easy to find pictures you are interested in. Well here's this month's progress. • We have a painter going room to room now. 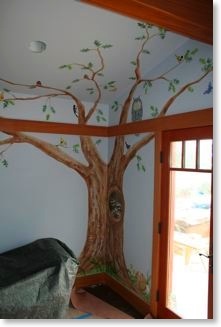 We had a muralist paint this big oak tree with animals in the kids' room. • We are almost finished laying all of the exterior flagstone around the house. The driveway will be poured this Saturday. 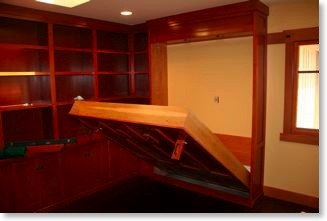 • The master closet is complete. 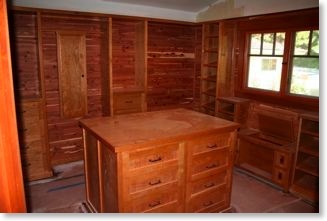 Cedar-lined walls and American cherry cabinets. • The library is built. 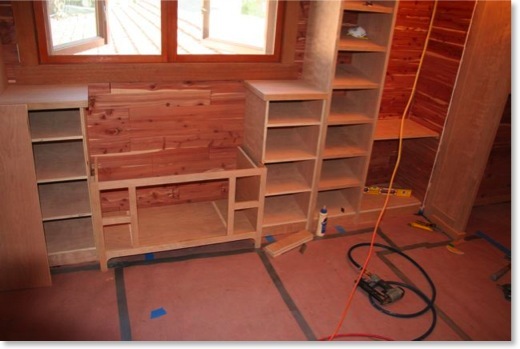 In fact, all cabinetry is complete and will be finished over the next few days. 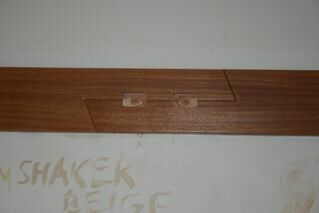 • The stair treads have been sent out for finishing. Dave is starting on the wainscot in the bathrooms and the newell posts for the stairs. 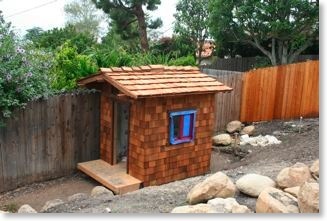 • A playhouse was built in the backyard. We used the leftover shingles for siding, shingles for the roof, Brazilian Cherry and limestone for the floors. Scaled down rafters were carved. It looks awesome! • The waterfall and pond construction will start any day now. • I had almost half of the exterior stone siding removed and replaced by a new stone guy. My first guy is great at ceramic tile but not so when it came to stone. 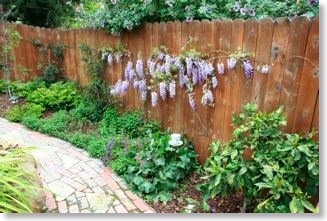 • I almost forgot....For the past four months, Matt Keyes of Keyes Landscape Design has been implementing the landscape design. It is amazing! So far we have 18 tons of boulders and need another 6 tons. I believe the landscaping will actually finish before the house now. There is a consistent group of guys that work 6 days a week, 8-10 hours a day. They are really good and fast! • The North retaining wall is complete. • The master bedroom fireplace mantle is complete. • The painters are starting upstairs tomorrow. They have a lot of sanding to do. • Su Bacon of Historic Lighting is coming out tomorrow to see the house and advise on entry and stairway chandeliers I'm purchasing from her. They are designed by the craftsman Karl Berry from New York. Su has been a consultant on many big projects. When we went into her Arcadia store, we found out that she was consulted for lighting on the TV show Extreme Makeover: Home Edition. I told her about the living room fireplace we were creating based on a picture I saw in a magazine. She knew it well as she was the designer. How cool is that! • My updated guess on a move-in date is mid May. I received a letter from the City stating that the permit will expire on May 12. At least we now have a target date. I would still like to shoot for final inspection by May 1st. 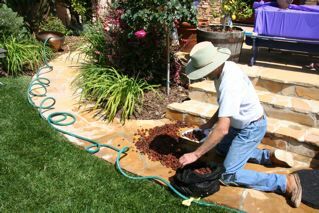 • Drainage was put in on the North side of the house. 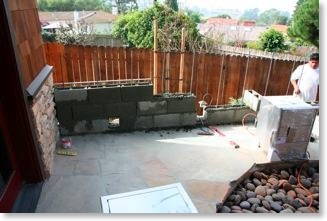 • Concrete was poured on the North side so we can now build the block wall for the planter. • Two carpenters and the electrician are surfing and camping at Big Sur for the last two days. 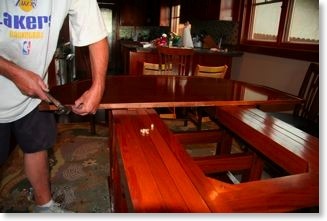 My GC is sick with food poisoning and Dave, the finish carpenter is on another job for 2 days. In other words, NO WORK FOR THE LAST 2 DAYS IN THE HOUSE. How in the world will we finish in time when things like this happen? I have finally caught up with the pictures! I have been taking more than I could annotate and finally caught up today. I am adding about another 500 pictures from the last few months. So let me give you all the rundown. • I created the stained glass for the light in the December 18th blog post only to find out that half of them were too small. After another week of stained glass work, I finished and my fingertips were raw. 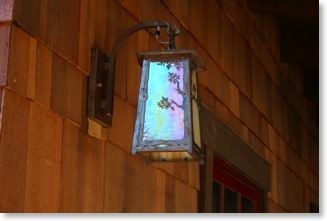 I brought the glass panels to Old California Lantern Company for installation and received the lights about 2 weeks ago. They are absolutely stunning! • The floors are installed. Lesson learned - make sure the installers verify that the door still opens before the whole thing is laid!!! • The kitchen, laundry room, and master bathroom American cherry cabinets have been stained with Jel'd Stain Red Mahogany by Wood Kote. 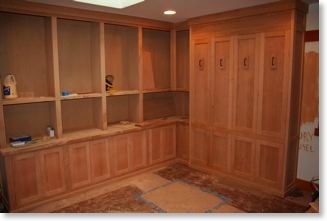 • The walk-in closet cabinets are almost complete. 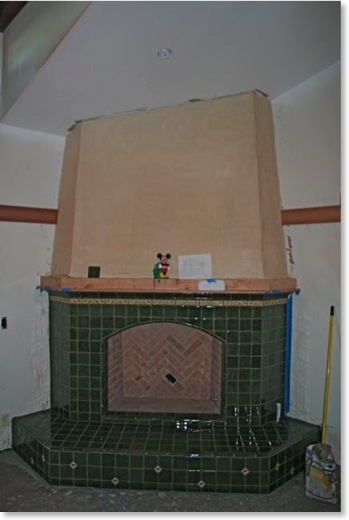 • The master bedroom fireplace is covered with a beautiful Batchelder tile from Mission Tile West in Santa Monica. • The living room entertainment center is built and ready for finishing. 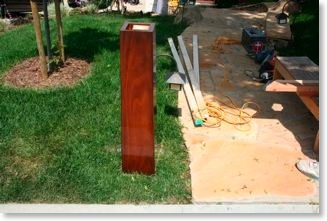 • Dave Barlow is installing the ebony plugs in the scarf joints around the house. 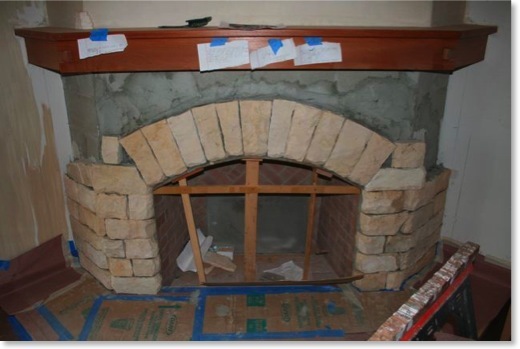 • The living room fireplace is having Moonlight flagstone installed right now. It's a very slow process as each piece is being chiseled to the right dimensions. Look on the left part of the mantel and you can see my sugar cube mockup of the stone corner. I made this to make sure they understood how I wanted the 45-degree angles handled. • The appliances will be installed tomorrow. 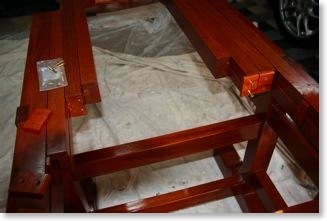 • Clear-coating of the mahogany will start in about 2 weeks followed by painting the walls and ceiling. 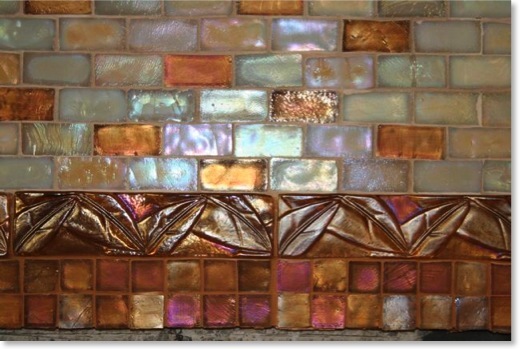 • Glass tile from Mission Tile West has been installed in the kitchen. It looks amazing! Well, I'm going to start uploading the pictures now and then I'm off to Kauai for my 40th birthday. Yes, I'm delinquent with the update again.There are a lot more pictures that I haven't had a chance to put on the site yet so keep checking back. A lot is going on around here. 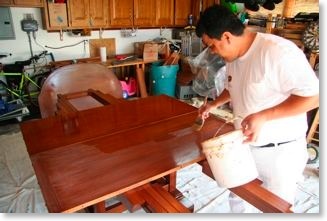 • I'm really busy now creating the stained glass for some authentic Gamble House reproductions. The stained glass will be different and my own design. I'll tie that into the front door window whenever I get around to it. 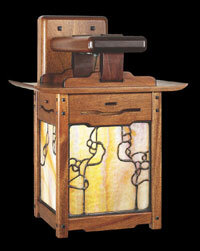 Go to Old California Lantern Company to see the best Arts & Crafts lanterns. I went in there and 3 1/2 hours later I outfitted my entire house. • The hardwood floors are being installed right now. 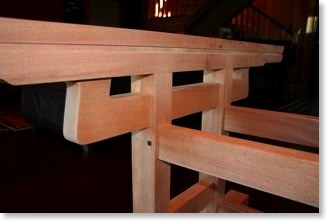 It is long-length (8'-16'), quarter-sawn, 5"-wide, Brazilian Cherry. We are having a slight bevel put between the planks to give it an older look. 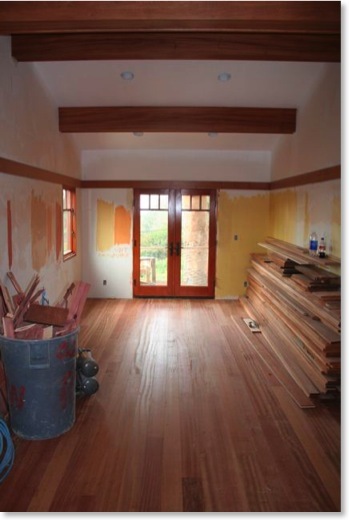 The floor will be stained black, sanded, and then stained with a green dye to subdue the bright reds associated with Brazilian cherry. 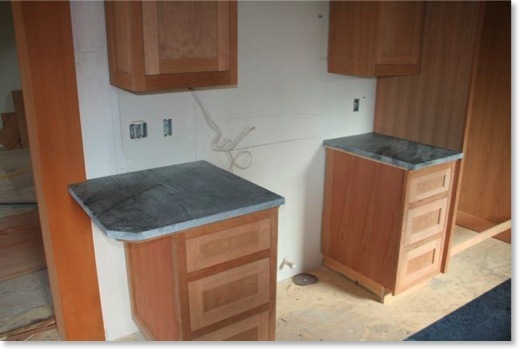 The soapstone countertops were installed in the kitchen and laundry rooms today. 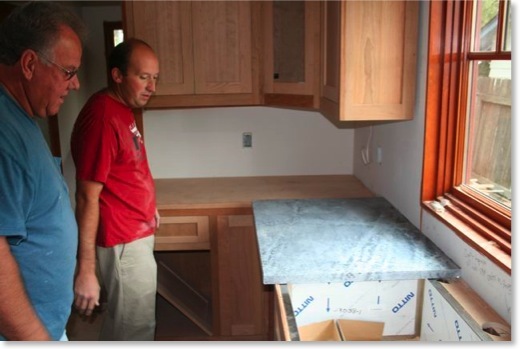 The templates were made on Tuesday and the countertop was installed on Thursday. Soapstone West has great service! Below is a play-by-play of the installation. 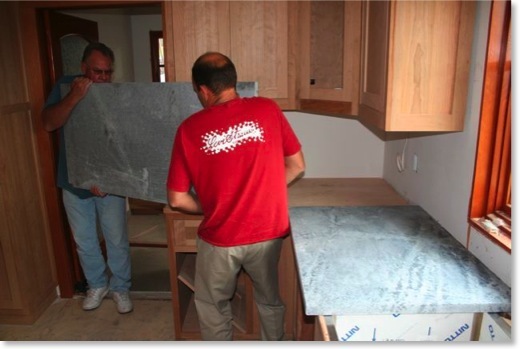 These guys drove in from Arizona, and within 2 days measured, fabricated, and installed the soapstone countertops. These slabs are HEAVY at 20 lbs/sq ft. There is a 3/8" overlap of the sink. The holes for the faucet, soap, drinking water, and vent are drilled. 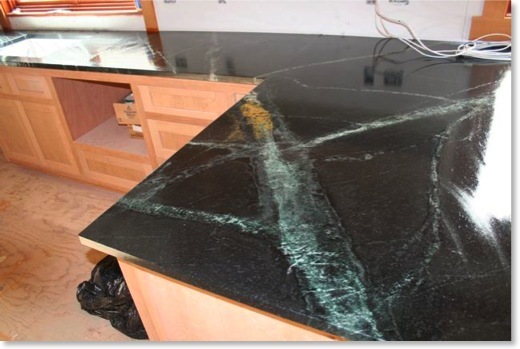 Black epoxy is mixed up to join the soapstone pieces and fill in any voids. A ding is repaired with the special epoxy. After it dries you can't even see it. Even through the talcum powder layer you can see the caramel vein showing through. Soapstone installation is messy work. 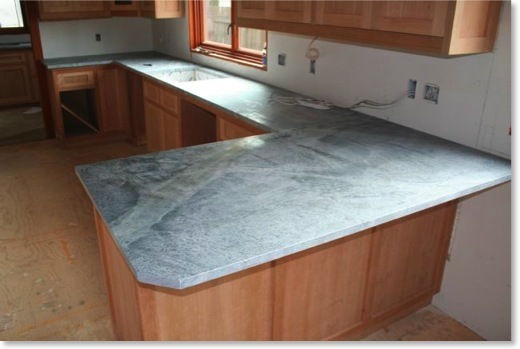 Soapstone is much denser than granite and can't be stained. 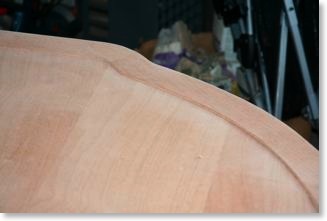 However, it is soft enough so that hand sanding can be accomplished to smooth the edges. This looks gray now but wait until it's oiled. I oiled the soapstone with mineral oil. It's shiny because it's still wet. When dry, it will have a matte finish. The counter looks great! The door to the laundry room has a "Delta" pattern in it. Lately, I have been overwhelmed with the number of things going on at the house and though I have been taking pictures, I have not had time to annotate and post them. They will arrive, just a little patience. • The master bathroom has been tiled and looks great! 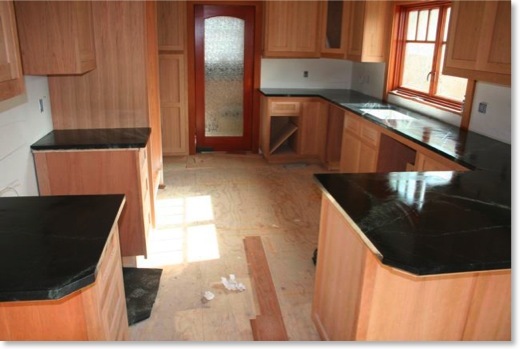 • Cherry cabinets have been installed in the kitchen, master bath, and laundry room. 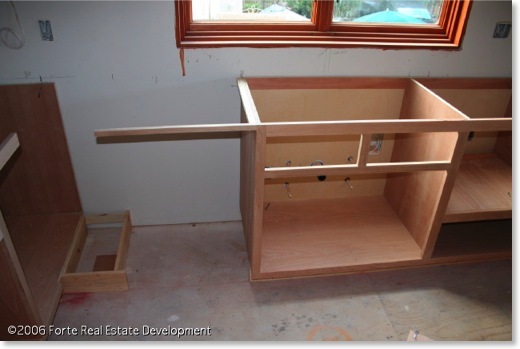 Unfortunately, the kitchen sink cabinet was 3/4" off center from the window. 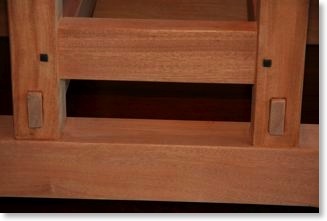 The cabinet had to be shortened by 3/4" on both ends to keep it symmetric and centered on the window. 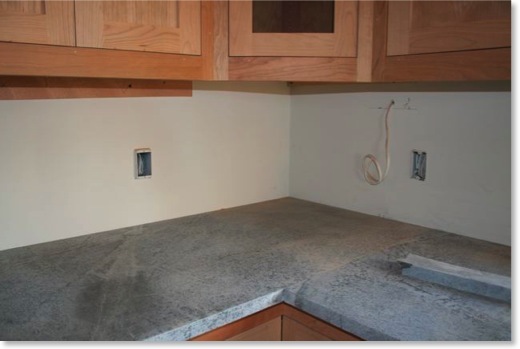 • I have purchased the soapstone slabs for the kitchen and laundry room from Soapstone West in Escondido, CA. • Brazilian Cherry floors have been ordered from Dutko Hardwood Floors in Lawndale, CA and will be installed the first week of December. Talk about a backlog. • The fireplace mantel has been installed and stained. Plaster will go above it and Moonlight flagstone will go below. It will be cut into manicured blocks of varying size. • Actual work has started on the staircase. There was a lot of planning to get to this point. 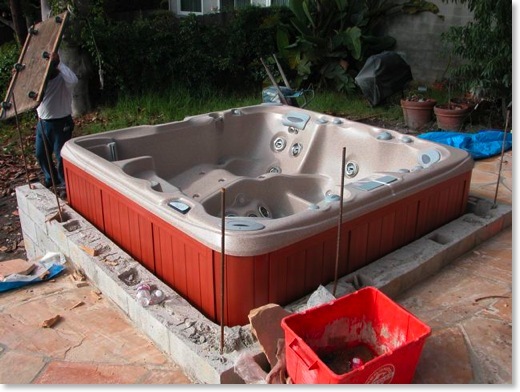 • The hot tub has been delivered. We're just waiting for power now. 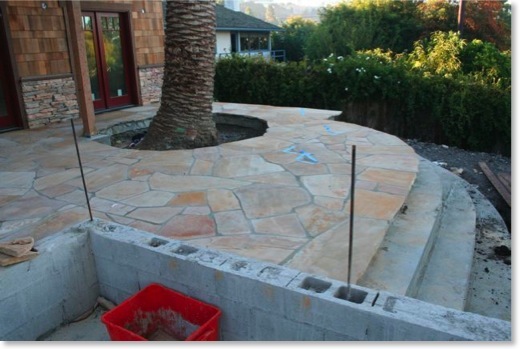 • The Golden Busckskin flagstone has been installed on the front and back patios. • The green slate has been installed on the balconies. 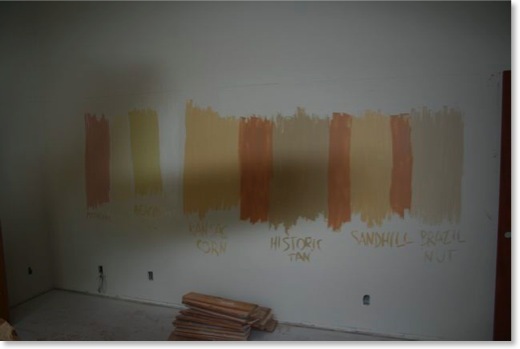 • Paint samples are all over the walls. I hear they will start within 2 weeks with the paint. 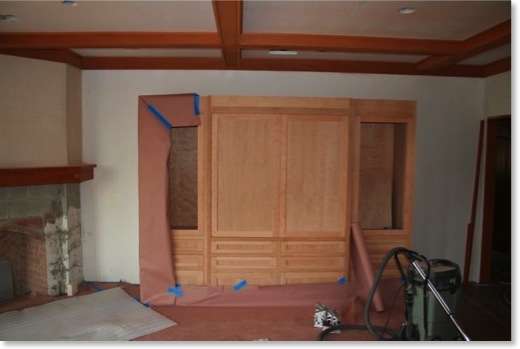 • Interior doors are installed and stained. Not much has happened the last month. Vacations and other jobs have gotten in the way. However, the work that has been done is looking really good. So here's the run down. 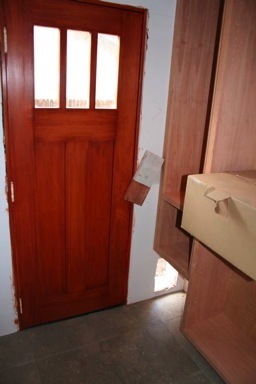 • All interior doors have been ordered but we have to wait about a month. Expected delivery is 9/14/05. 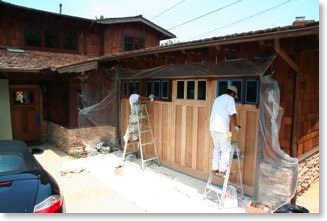 • The garage door was installed. • Interior of house and garage has had two coats of primer applied. • Master bathroom has been floated and is ready for tile. 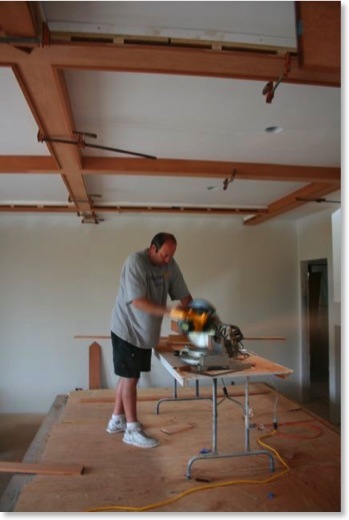 • The ceiling beams are being installed single-handedly by Dave Barlow. 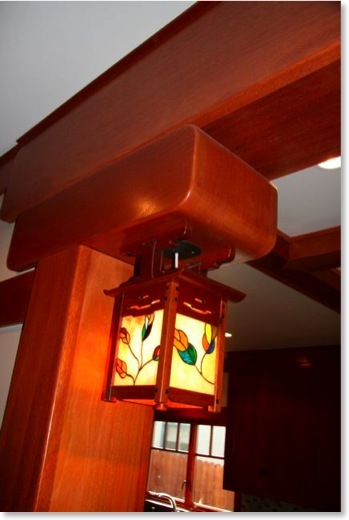 The planning for this was extremely difficult as there is quite a bit of wood and detail in a Craftsman style house. We are designing the layouts on the fly for the ceiling, crown moulding, plate/picture rail, floor trim, wainscoting, and staircase. All of these pieces tie together as one entire wood 'system'. Our design of this is staying about one or two steps ahead of the build. 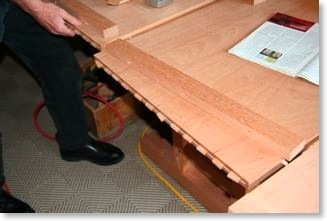 One problem is that we don't have our wood floors in yet so we can't build the jambs up from the floor. • Bad news. I took a trip and my camera got some dirt in it. It now doesn't work so no pictures. The new camera should be coming in a few days. • Drywall is sanded and just about ready for primer. 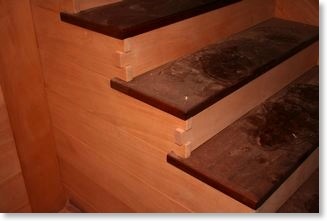 • Dave Barlow is working the staircase and will be doing other fine carpentry in the house. He is creating mockups of everything out of MDF (fiberboard) prior to cutting the real wood. • All shingle and stone siding is installed. • The siding continues to go up. I think the variation in the tone makes it look very interesting. Anyway, it can't be stained until at least June 2006 so no need to worry about it now. • Drywall inspection is tomorrow. 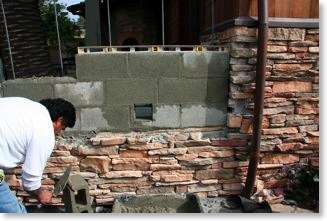 • Stone siding starts to go up this week. • Got back from vacation and the house was all white instead of black when I left. It's covered now in a Tyvek waterproofing layer. 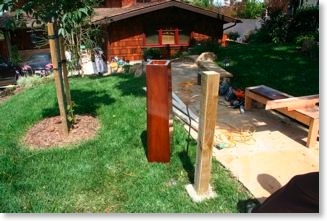 • The water table was installed. This separates the shingle siding from the stone base. • Window trims are being installed. 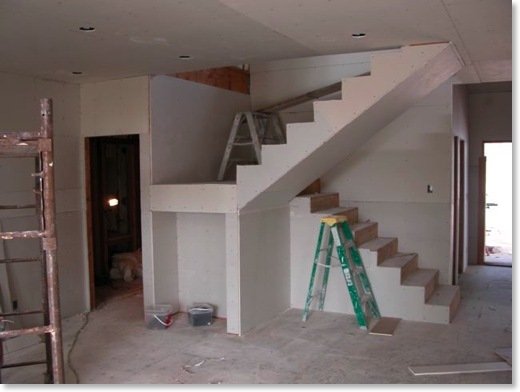 • The drywall is almost complete. Inspection of the screws should take place this week with taping to follow. • MAJOR ISSUE! The shingle siding is being installed and the color variation is a bit more than expected. 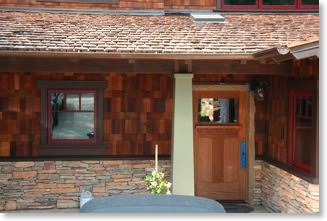 On its own, it looks great but when the stone siding is added it may be too busy. We called Cabot Stains and asked them what we could do and they said we have to wait 1 year before we attempt to paint a different color stain on it. Oh well, live and learn. I have finally uploaded the pictures for the last 2 months. • Today I went to the neighbor over my backyard fence to inform her that a survey was done and the fence needs to move about 10 feet onto her side. She said do whatever I need to do. Now wasn't that nice? I told her I'll landscape her side of the fence. • The roofer has started to cover the black paper with a rough asphalt paper. 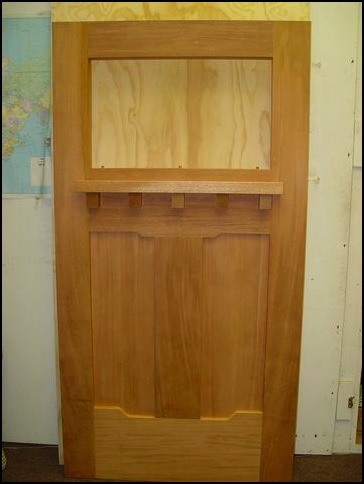 • The front door jamb has been installed. I have been really busy and haven't had time for updates. I have finally organized the new pictures since my last posting on 4/16/05. I will load them up sometime this week, I promise. Here are the latest issues. • All plumbing and electrical in the master bathroom has to shift to the left by about a foot since we had a designer lay out the cabinets. 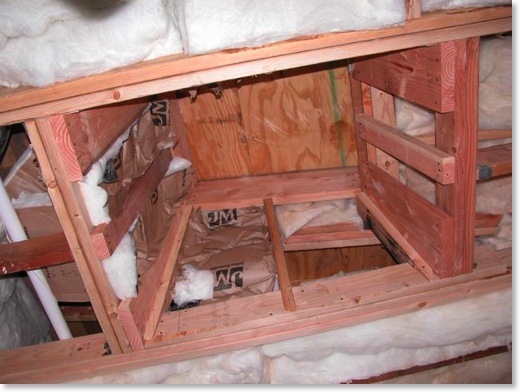 • All insulation has been put in. 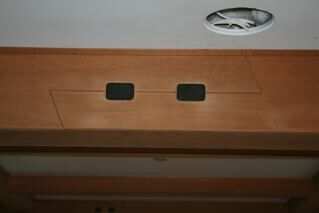 • I installed in-ceiling speaker brackets for surround sound in the living room. 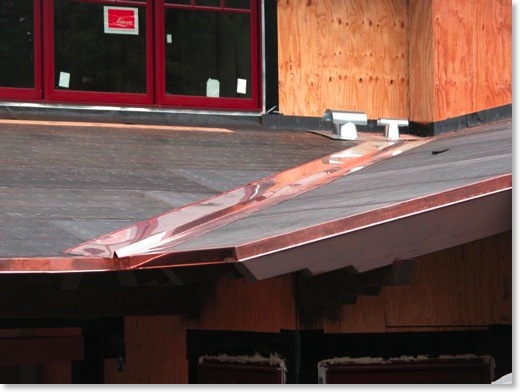 • Copper flashing is going on the roof. • The shower has been hot-mopped. We were told to pick out all bathroom tile and balcony and laundry room flooring this week. • Skylights have been framed. • The kitchen range vent has been put in place. One of the joists had to be moved over and plumbing rerouted to make room. 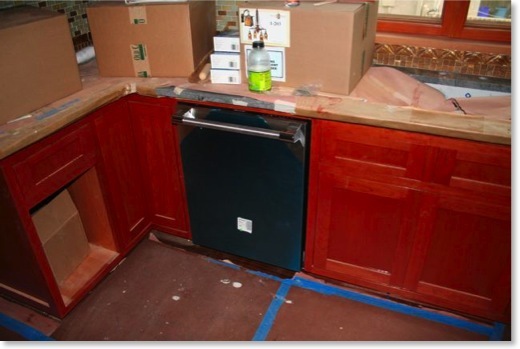 • The Thermador range and Thermador dishwasher were delivered last week. I found a place in Alabama (Fredrickson's Tire and Appliance) with amazing prices through eBay. They were clearing out a supply of Thermador appliances from a warehouse that closed down. They bought everything up and were liquidating at wholesale prices. 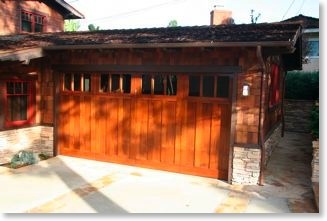 • With the extended garage roof you now hit your head when walking around the corner. So, we dug down about 2 feet around the garage to lower the grade. • Still working on updating the pictures. They should be coming within the week. • There is still quite a bit to do before inspection. We had a telecom installer come out and install phone (Cat 5), cable TV (RG6), and Ethernet (Cat 6). There was about 1700 feet of ethernet wiring installed. It's easier to put it in now than later. For example, it's behind TVs, in the kitchen, etc. I won't be using it but in 10 years or so it may be needed for home automation purposes. It's also a good selling point if I ever go down that path. • Wall sconces have been wired. 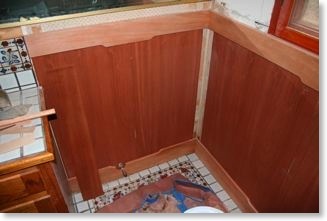 • Plumbing is almost complete. Just finishing up the gas lines. 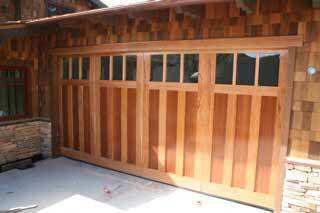 • The garage door has been ordered from Designer Doors. This is going to be really nice! • Issues continue to test my patience in the kitchen. There are so many wires, pipes, and ducts running through the ceiling that we are having trouble figuring out how to get a 10" duct from the range hood over about 10" off center to fit between two joists and vent out the wall. 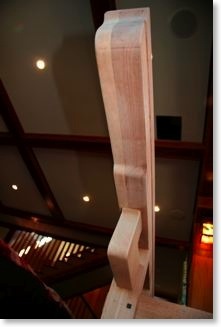 • The ceiling beam patterns are a challenge since we decided to add the kitchen into the remodeling mix. We decided to stop the ceiling beams at the boundary between the kitchen and dining room so the living and dining rooms only have beams. Kitchen ceiling is TBD. • The remaining part of the block wall on the rear patio was cut down yesterday. I'm still working on my disastrous photo database problem. I'm in the process of re-identifying the 1500 pictures with keywords so I can upload the new pics. Here is what happened. During an upgrade of iPhoto, I messed around with some file I shouldn't have and all of the keywords and captions associated with each picture was trashed. This will take months to get back to where I was. • The roof has been covered with paper. • Velux skylights will be added to the entry, and all downstairs bedrooms. These skylights have remotely controlled blackout blinds built in. I definitely wanted a chandelier in the entry but Amy was saying it was too dark. Our solution is to put in a 24"x24" skylight that is parallel to the floor instead of the vaulted ceiling. Wood trim will be placed around the opening to match window and door trims. From the four corners, wires will be strung to hold an as yet to be determined chandelier. I'll probably have to make it. I'm envisioning a 4-sided inverted pyramid with stained glass panels. During the day it will be illuminated by the skylight above and at night it will work as a regular chandelier, i.e., it will always be lit up. 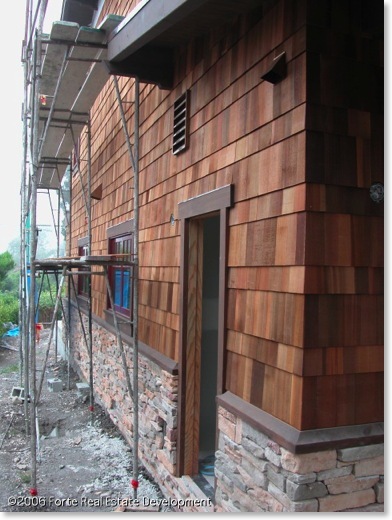 • The cedar, shingle siding has been ordered from Cedar Valley in Hollister, California. 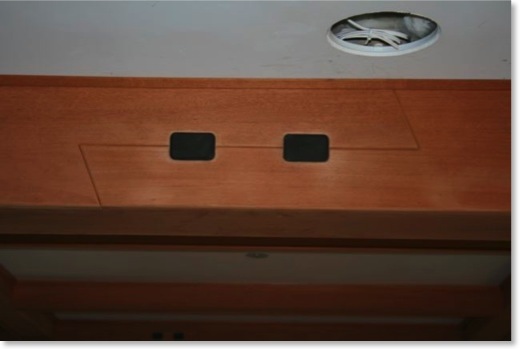 • Beam locations in the living room, dining room, and kitchen have been identified by string. 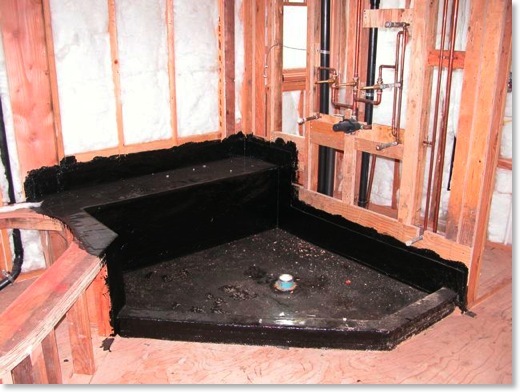 This allowed rough-ins of plumbing, electrical, HVAC, and central vacuum systems. Inspection should be next week. • The patio was poured. • All doors are now installed except for the front door (being built) and the side door (just ordered it). The side door is made by TM Cobb. 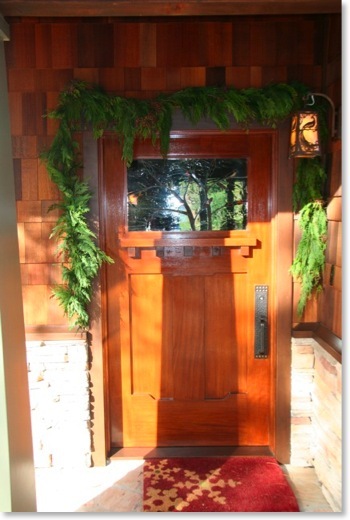 It is a Stickley model with a mantel from the Greene door. Edited October 29, 2005: The actual door interior and exterior. • Hose bib locations have been identified. I had no idea that I was going to be designing the interior of this house on the fly. • Spent the last few days identifying all lighting that was not on the original plans. 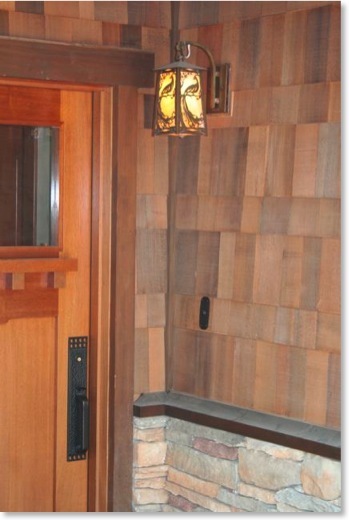 This includes wall sconces inside and outside. • Roughly laid out the beam design separating the living room and dining room. A lot has happened in the last 2 weeks. Here's the rundown. 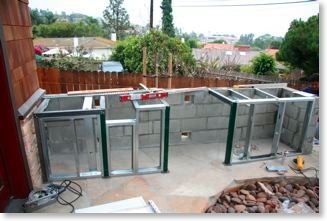 • For the past week, I was pushing the masons to hurry up and put in a block wall around part of the patio according to the plans. Amy came over to see it that night and we both decided it was too tall and closed in the patio too much. The following day I had the guys tear it out. It wasn't very fun telling them that. • Installed all windows. Working on doors now. • The roof is sheeted, now it's ready for waterproofing. • Heating ducts have been a pain in the neck. Multiple small changes have been needed to make the design work. A lesson learned is that none of the subcontractors know how the other is planning on roughing out their lines. As a result, heating ducts start to go in and one by one I tell them why it can't go in a certain spot. A soffit was created upstairs to handle the ducting. Downstairs, ducting is being run without knowledge of the final beam layouts on the finished ceiling. I'm having stuff moved. They wanted to run ducts right where I need my range vented out in the kitchen, etc., etc. 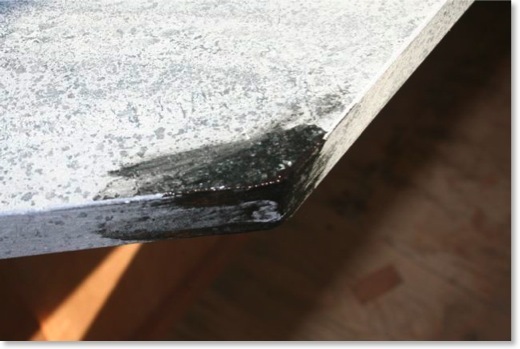 The bottom line is make sure you are on site a lot during the rough-ins to make sure everything works. Only you will know how the end product is going to be used. Today I helped install the first windows. They look even better than I hoped they would. The Loewen windows and doors were delivered today. There is a scratch on the 8' french doors. Somebody will need to come out and fix that. I'm told it will be after all exterior work is complete. • The rough plumbing is going well. Only about 4 more days until it's done. • The master bathroom shower, sink, and tub fixtures were picked today. They are made by Phylrich - Carrara Beige Model Series. The finish is oil rubbed bronze with the beige marble handles. • Chose Mr. Steam MS-400T for the master bath steam shower. I purchased it and then found it for about $150 less. Oh well, maybe I'll save next time. This site has everything! • The electrician started today and mounted electrical boxes around the house. It seems the code of a box every 6 feet is excessive. 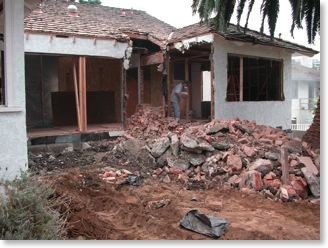 • The garage was torn down today due to wood rot and termites in preparation for the new garage framing and roof. This was not part of the original plan. • Hired John Bauman, landscape designer and former owner of the Begonia Farm Nursery. 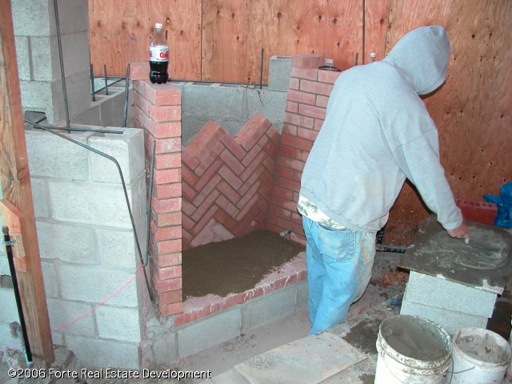 Pete Ramage of Ramage Masonry has started the fireplaces and the plumber, Jaime, is putting in the gas lines to them. The eaves and rafters were stained today using Cabot Stain's Bark color. I had everything brushed so it would reveal the grain better and give it an older look. It worked!!! When the painters first started, they were spraying and we had to stop that fast. Instead of seeing the grain like in this picture, everything looked solid brown. • Today we finally picked the actual colors of the house. 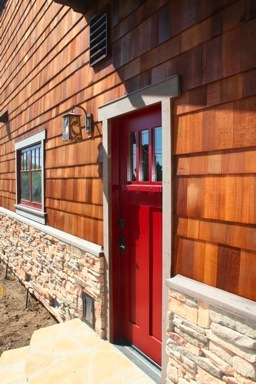 The shingle siding is a clear-coated natural cedar. 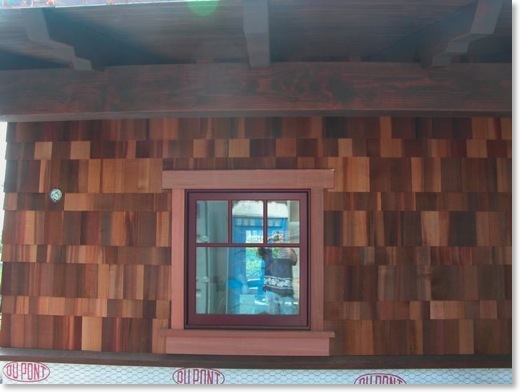 The window and door trim, rafters, and eaves are Cabot Semi-Transparent redwood stain. The balcony railings and trim are Passion Vine, an olive-green color. All colors except for the siding were actually choices I made after the Art Jury told me what they liked. It was easier that way since it gave me fewer choices. 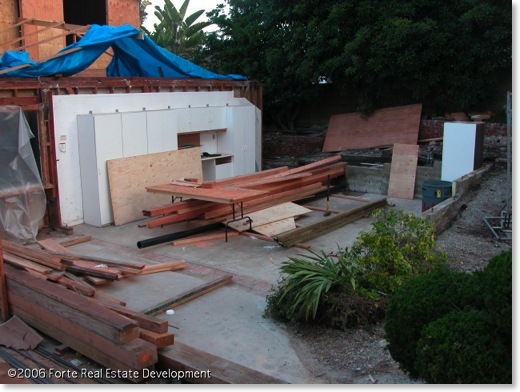 • Gave Joe Madden of Madden Millworks in San Pedro the go-ahead to start construction of the front door. I'm working on the front door right now. 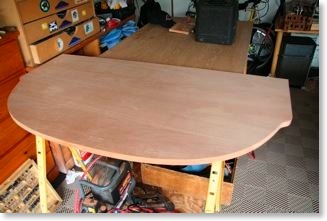 This picture is a sketch of what I'm trying for with a darker (mahogany) wood. I'm going to do the stained glass myself along the lines of what is shown. By the way, the rain is coming again next week. We should get another 2 inches which will push L.A. up to the second rainiest ever. I guess I was just lucky to start building this year during this monsoon season. Maybe we can be number one soon. UGH! 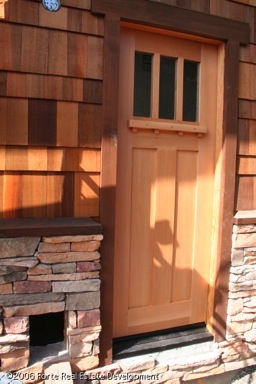 Here is a picture of the actual door at the mill and with the final stained glass. If you look closely at the raw door, you can see the three plugs at the base of the window frame. These remove to allow me to remove the frame and swap out the glass at anytime. Today's GOTCHA. 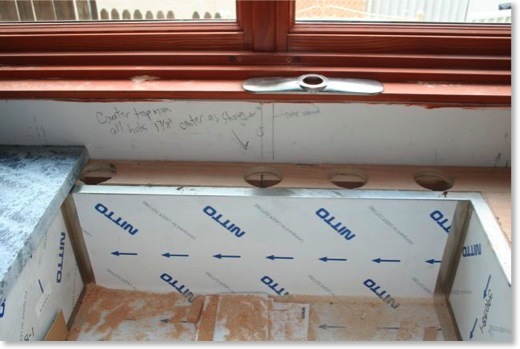 I was at the house looking around at the framing on the second floor and noticed that the master bath window seemed much larger than what I had remembered so I pulled the drawings and measured it. It says the window should be 4 feet wide with a 4 foot wide shower. Then I looked at the window schedule and saw that 2, 2'-6" windows were to be ordered for the spot. Now my shower would be quite narrow. I decided to swap the shower with the counter at the opposite corner of the room. This will not only give me a larger shower but will move all of that plumbing to the outer wall of the house between the tub and toilet. A win-win in my opinion. Well we got about 10 inches out of that storm. The job was shut down for over a week. This makes for about 6 weeks of delay due to rain so far. A lot of water came in on the remaining wood floor. Let's see what's left of it when the masonite is removed. The tarps couldn't handle all of the water and the ceiling fell down in one of the downstairs bedrooms. Second floor framing work starts today. It's raining again! This is getting ridiculous. It's supposed to start again on Tuesday and go at least through next Sunday. Also, I have given up on the server downtime and moved the whole web site to a real company. Some pictures of the web server set up during the construction. I'm going to move it out of here real soon as it is difficult to keep it running. 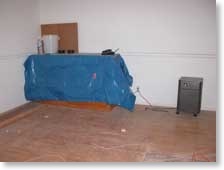 The web server is under the tarp. The phone box was moved onto the tree to keep this site going. The workers broke the DSL connection so I had to splice it. There's another one about 20 feet down the wire. It's raining again! The tarp on the roof started to blow off so Rich went onto the wet, shake roof with muddy shoes. Needless to say, he slid all the way off. He said he is just fine but probably used up one of his nine lives. Major issues today. The city building inspector came by and said that we can't build a second story on a foundation wall that is only 6" wide (six inches is standard for one-story houses here). So he decided to stop the concrete pour before we started. Rich had to run to the city engineer to have all of the calculations reverified per the city. That apparently was not good enough so luckily we got the engineer to come out to the house and visually inspect the footings. Everything was OK and we got to pour on Monday. That cost us a few days. 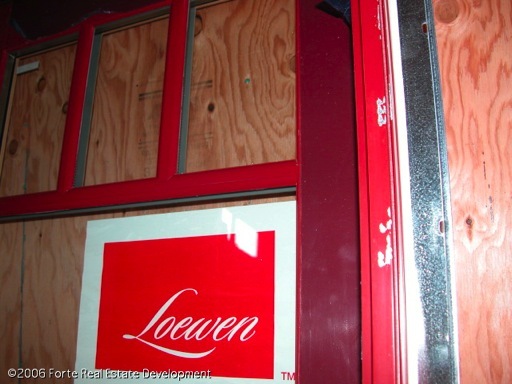 Loewen windows and doors were ordered today. 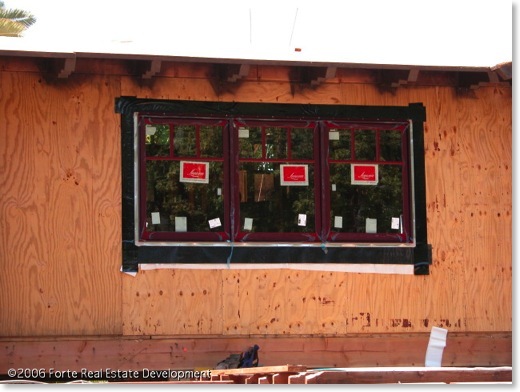 They will be push-out, french casements in a cranberry color. 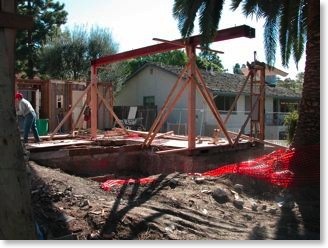 On a completely unrelated note, I was told that the concrete for the foundation under the house will be poured on Friday, 1/21/05. Much of the large timber frames from the demolition were saved for reuse during the project. 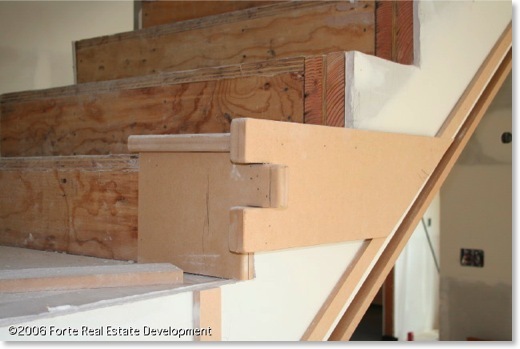 For example, several 2 x 6's were used to reinforce the floor joists. 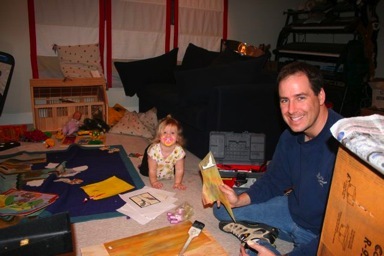 Rich Wright prides himself on being able to save the wood and reuse it whenever possible. Several very large beams from the living room will most likely be reused in the new living room. 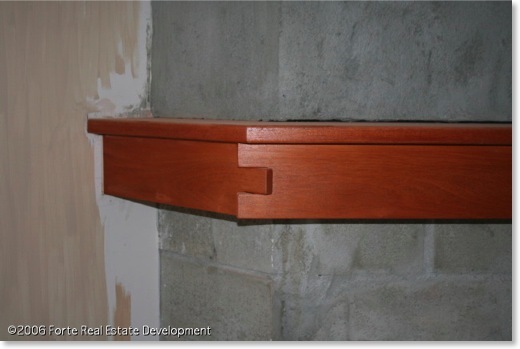 This beam was put in to support the second floor balcony. The first stretch of dry weather is finally here. The last 2 1/2 weeks have been nothing but rain, about 10 inches worth. The outside trenches have water in them but on the other hand, the demo guys are having a field day. There are now 10 guys working on the site. Five of them are under the house digging a massive trench for the foundation reinforcement. Things should happen quickly now. It started to rain so a last minute decision was made to not remove the roof. We ran into a little snag today. 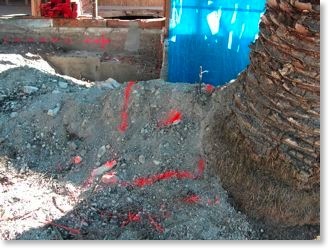 A footing (~8 ft. deep) can't be put in because it is adjacent to the date palm tree. 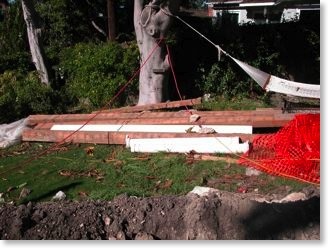 The contractor called me over to the house and by 9AM he was on the phone with the structural engineer for a redesign. Since we can't put the footing in (kill the tree) or move the tree (block the view), we are going to put in a 22 ft steel beam (1200 pounds) to cantilever the upper deck. With all of the cutting away of the floor for the foundation reinforcement and the rain we have been having, today we decided that it is more trouble than it's worth to save the hardwood floor in the living room. This is 2 1/4" quartersawn oak at about $12/sq ft installed. 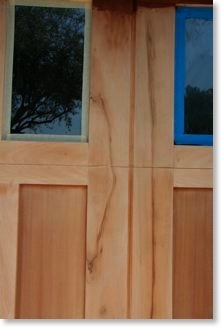 With all of the holes in it, it would be very hard to match new to existing wood without seeing where it was patched. Also, the wood is only 1/2" thick instead of the standard 3/4". This just complicated the problem. The middle of my living room floor is being cut so the foundation can be reinforced. The Art Jury finally stamped the drawings allowing the City to issue the construction permit. It only took 22 months and $40,000 just to get to this point! Now let's build it! The Art Jury finally reviewed the final details for a wall cap, roofline, and chimney. That was what they were holding up the permits for. All of these these items are aesthetic and located at the top of the house. None of these items would have impacted the foundation permit. The structural plan check was cleared today with the City building inspector. The City also issued us a partial foundation permit. It was partial because the Art Jury wanted to see some aesthetic details before allowing any work on the patio or front porch foundations. Total overkill in my opinion! With our temporary demo permit in place, we can start demolition. Now we aren't planning on tearing the entire house down but rather save as much as we can and do a minimal amount of changes. A full set of pictures with captions can be seen in the Photo Gallery. Well we got a permit to allow for a partial demolition. The Art Jury is holding this up saying that they want to see some details on the plans. I hope this is the last one. Today we hired our general contractor, Rich Wright Construction. 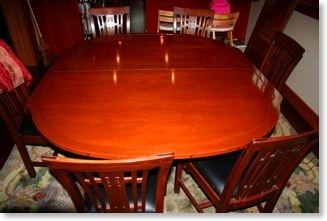 Rich was highly recommended by everyone I talked to and is a master woodworker. He also surfs! Today we sent out packages to four different contractors to start the bid process. I used Service Magic to get matched up to contractors that could do this sort of work. We need to get this going as the contractor will be pulling the permits. The City asked for more money today to look at the plans. The design Development drawings were sent to the structural engineer at Palos Verdes Engineering. The Art Jury is requesting another payment to look at the plans. Tony Lee, a soils engineer, came out today to take core samples of the soil around 4 parts of the house. The city has requested a soils report today. The silhouette finally can come down now that we waited the 15 days appeal time following the Planning Commission meeting. Today my architect, Olympia Greer, and I appeared before the Planning Commission. Click here to see the meeting (44 min / 26.8 MB) and YES I know I move around too much in the presentation so please don't tell me. In addition to the architect, I appeared before the board to counter complaints by the house next door to the North. The complaint was that ambient light would be blocked by the new house. I didn't sleep well the first night after hearing of the complaint but on the second night at 3AM I woke up with an idea. I went online and downloaded sun position data for the darkest day of the year in Los Angeles, December 21. Since this is the lowest the sun will ever be in the sky I could see what the worst case situation would be for the blocking of ambient light. I charted the sun position on overhead as well as side view charts showing both houses. It clearly showed that on the worst day of the year, the sun would go behind the top corner of the house from 2PM. At the meeting I gave each commissioner a set of charts and walked through them. Some were shaking their heads and making facial expressions that seemed to say "get a life", and "you can't dispute the facts". One commissioner thought they meant their view would be blocked. Three things, I believe, helped me. 3) The written letter specifically said "ambient light". Another complaint was by a neighbor to the southwest who complained that the house would look like a big apartment building. We accommodated them and put in a window and balcony to soften the appearance. I think I got the better end of the deal on that one. Needless to say it was a nail-biter but we won approval by 3 to 2. The silhouette flags were readjusted to show the shallower pitch requested by the Art Jury. The entire roof design was changed. The silhouette flags were installed on the house today. This allows neighbors to see how the proposed house impacts the neighborhood. For all silhouette pictures, please visit the Photo Gallery. The initial design is ready for the Art Jury and Planning Commission to review. The issues were that we were mixing Ranch and Colonial style features on the house and that we should pick one....so we picked Craftsman. 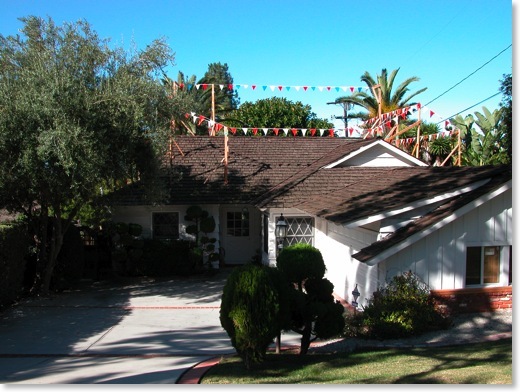 In California, it evolved from the California Bungalow. Craftsman-style houses are evident all around the Los Angeles area and especially in Pasadena where Greene and Greene really developed this style from their Japanese and native material influences. 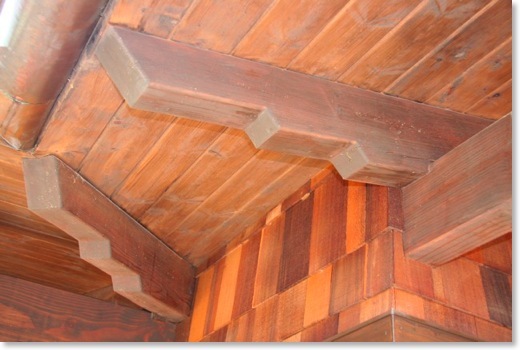 The Gamble House is a big inspiration in this project. Reviewed the initial design with the architect. Today is a big day! A retainer was given to Olympia Greer, our architect, to start work. After interviewing several people, we chose to go with Olympia Greer. 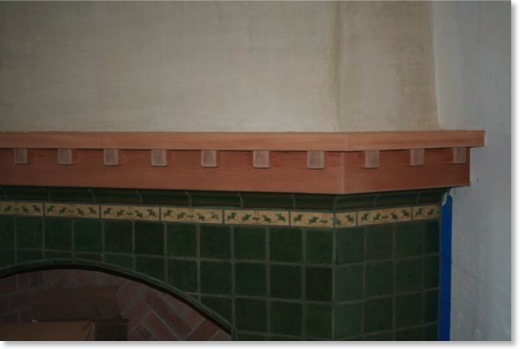 We chose her because she has a great design sense and lives and works in Palos Verdes Estates. 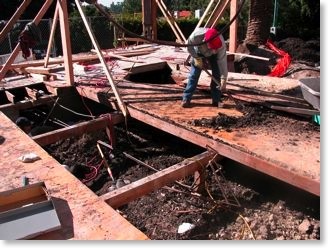 Before I get into the daily details, it would first be beneficial to tell you how the construction process works in Palos Verdes Estates. I found a great picture on their web site that is posted below. Basically, all construction needs to go through the Art Jury, part of the PVE Homes Association, and the the City's Planning Commission. The first step is to get your drawings approved for aesthetics by the Art Jury. After their blessing, you can then go to the Planning Commission where they will weigh in on neighborhood compatibility, and listen to any neighbor's concerns. If there are concerns, you go before the Planning Commission and defend or compsomise on your position. The 5 members then vote to approve or deny your request for a permit. A majority of 3 members is required to grant approval. Must be local in case here are problems and we need to meet. Must be intimately familiar with the Palos Verdes Estates Art Jury and Planning Commission processes as the requirements and hoops to jump through are very complex for the novice. Must be able to understand what I want and run with it. I can describe only so much of the feel and expect the architect to elaborate on it and interject original ideas. 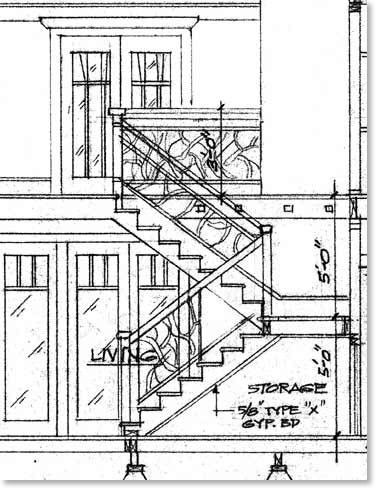 For example, take a look at Olympia Greer's vision of a Craftsman staircase railing.